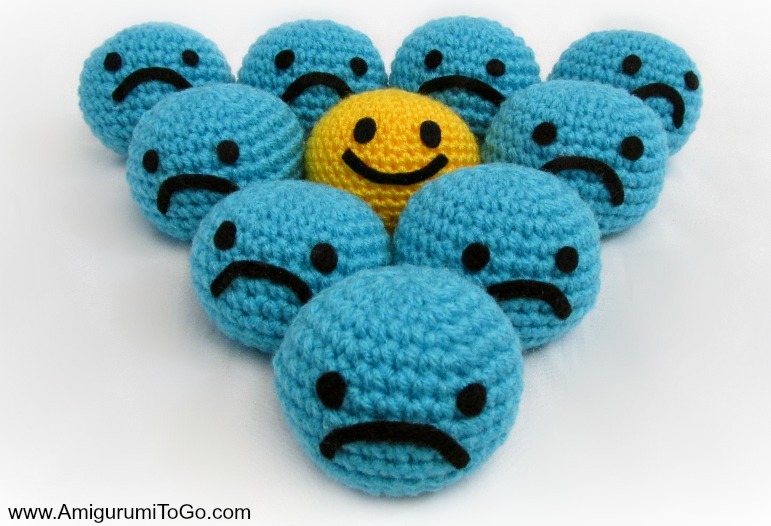 There is a famous picture online with a pile of blue "not so happy" smileys and one happy yellow one in that pile. Every time I see that picture I think of my aunt who we call our "Smiley Face Aunty". In fact one of my very first designs was a large smiley face that stands on 2 feet and I also designed that for her. You can see that pattern right here. 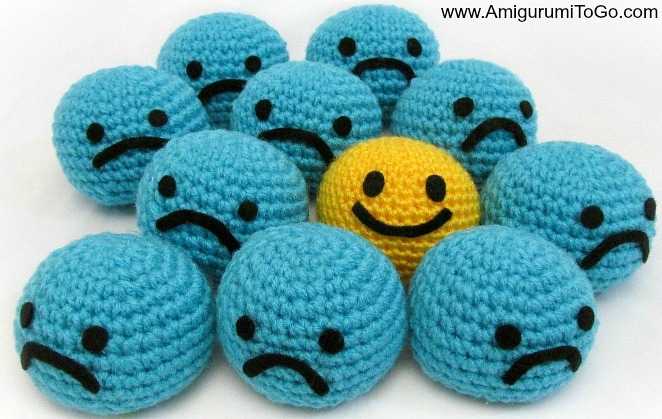 That smiley has been my profile picture on my facebook page, Amigurumi Freely since I started in 2011, I don't think I'll ever change it. 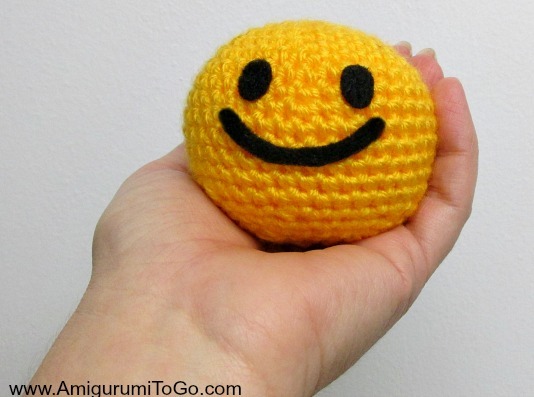 This is a small ball that fits in the palm of your hand. It's about the same size as a juggling ball. Cut round shapes for the eyes and a long thin strip for the mouth. Round off the ends of the strips. Glue these in place. The placement is adjustable of course so be sure they will look right on the rows I have suggested. The eyes are on the 7th row with about 4 visible stitches between them. For the sad mouth I put the top of the curve on the 8th row and the ends on the 10th row. For the happy mouth, the bottom of the curve is touching the 10th row and the ends on the 8th row. Love love LOVE these little balls. Believe it or not, it's just what I've been looking for. A couple of weeks ago I started making some teddy bears dressed in fireman's uniforms for a friend (5 of them!). I followed the pattern but was most disappointed with the size of what was appearing in front of me. I wanted a toy the friend's children could cuddle, this pattern was producing a bear that wasn't going to make it to 6 inches! I doubled the yarn and got a bigger hook and turned out 2 (so far) bears that were 15 inches tall (including the hat). Back to the original one I started and my reason for wanting a ball. All I got done of the original pattern was the body and head. One day I looked at it and suddenly thought, if I make another 9 of them and a ball, I could have a ten pin bowling set for a small child! 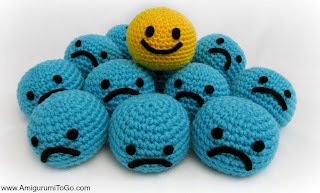 THAT'S why I'm grateful for the ball pattern, so a huge thank you to you for all your work. Another friend suggested I could use the little part bear as one of a set of Russian Babushka dolls, so I am also trying to work out how I could swing that one. Any suggestions would be VERY appreciated. This was my very first amigurumi! I wanted to say thank you for the hard work of making something so easy to follow along - especially having the YouTube video to reference as I went. This post would be made even better if you linked to how to make the magic circle and how to finish off (when mentioned) so that a beginner like me don't need to go to far in order to follow along. Thank you so much for your wonderful work. If you want to see my so far lonely ball (I'm about to start another) then take a look at my instagram account "kat_skinner". thank you, I'm glad you enjoyed the pattern. I'm a bit confused what you mean though. I always link how to do the magic ring in fact I also link another method as well and I def showed how to finish off, I do in all my videos. I was shocked by your comment so went to look and I indeed link 2 methods at 2:17 and the finishing off is at 23:42 where I even show how to thread the yarn through the yarn needle. So perhaps you were watching the wrong video? If you meant link it here in the post, you wouldn't have to go too far as the finishing off is near the end of course.. In my written patterns there is always 2 links to click on in row 1. Hope that helps! I've never made a ball and this was so easy to follow! Thank you sooooo much! You're awesome! I found a link to your magic circle tutorial on pinterest and then started going through some of your videos! Your tutorials are excellent! I am learning to make things but also learning how to read patterns! If only I had stuffing I would so finish my smileys right now!Thank you so much for taking the time to teach others! Thank you sooooo much ! Writen patterns just drove me mad and I came upon your video and hold on it (even if it is not my mother tongue) So well explained, thanks ! I did it !! I love your patterns!!! I have made several and have had no problems and find your instructions easy to follow. I would love to see a pattern for a doberman. I have been looking for one every where. So if your feel adventurous....I will differently do it and greatly appreciate it!! :) Thank You for your wonderful creations!! !